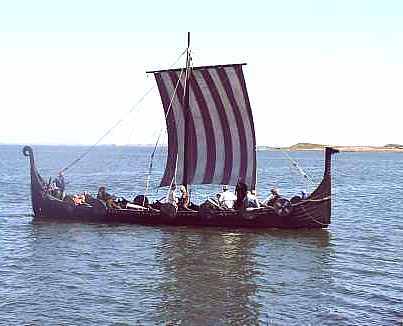 The Jelling Orm is one of the probably very few freshwater Viking ships, as it is found on the small Lake Fårup, south of Jelling. The ship was built for use in open-air theatre in the old Viking city. 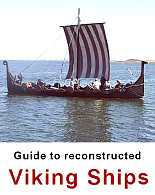 A large part of the local population took part in the project by building the ship, creating Viking costumes and so on. Open-air plays are no longer staged, but the Jelling Orm continues to ride the waves. Although the master builders were inspired by the Viking Ship Museum in Roskilde, it is not a replica of an original ship. It was inspired by details from various vessels, and the main aim of the project was to make the ship visually impressive. Thus, it is adorned by all the traditional paraphenalia such as dragon’s head and tail, and rows of shields along the gunwhale. Although the ship is based in a small freshwater lake, it frequently travels the open sea. 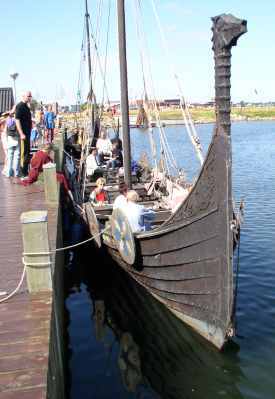 In 2003, it took part in the Struer Viking Fair by the Limfjord. In 1994, the Jelling Orm visited Estonia on a three months shooting of the Zentropa motion picture Den Sidste Viking - The Last Viking. It has also featured on Norwegian, Austrian and Danish television. Number of oarsmen: max. 14, can be rowed by 5-6 oarsmen. Terms of hiring: possible on rare occasions, such as Viking Fairs etc.